We bring you funds which have given highest returns consistently and how to gain from them. The past two-three years have seen a significant shift in investing patterns of many Indian investors, who till recently had strong preference for physical assets such as gold and real estate. The increase in household income and poor performance of traditional avenues such as fixed deposits, real estate and gold nudged many investors towards market-linked products such as equities. The real estate sector is going through unprecedented stagnation and has witnessed price correction across a few markets. Gold prices have largely remained range bound in recent years. The rate of interest on fixed deposits declined to almost a decade low in 2017. Even after some nominal increase in 2018, rates are still low, around 7.5 per cent, and post-tax returns even lower. Therefore, many investors were forced to scout for other options. With equity markets doing relatively better, many people have started investing or putting in more money into equities. The number of active demat accounts has trebled to around 34 million in November 2018 since 2007. Many investors are routing their investments in equities through mutual funds. The share of mutual funds among the total financial savings has gone up from 10 per cent in March 2016 to 14 per cent in March 2018, according to a report by rating agency Crisil. Mutual funds have seen unprecedented inflows over the past three years. Equity mutual funds have received `2.66 lakh crore as net monthly inflows for the past three years ending October 2018. The average assets under management (AAUM) of mutual funds has trebled from around `8 lakh crore in the September-ended quarter of 2013 to around Rs24 lakh crore for the same quarter of 2018. Equity markets have have rewarded investors well over the past few years. The average three-year return across categories is around 11 per cent in equity mutual funds, while over the five-year period it is around 18 per cent. The best performer has been the category of small-cap funds, which has delivered an annualised return of 23 per cent over a five-year period. Mid-cap funds returned 22 per cent while large-cap funds delivered a return of 13 per cent on an average over a five-year period. 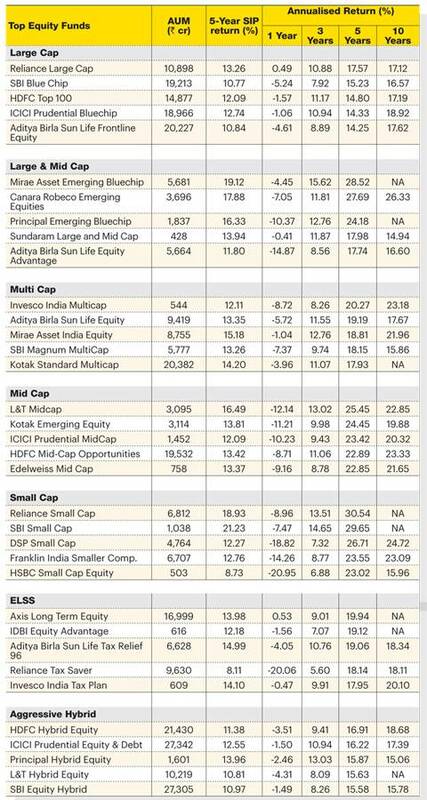 The top performing fund in the small-cap category, Reliance Small Cap, has given a return of 31 per cent over the past five years, while SBI Small Cap is not far behind with a return of 30 per cent. In the mid-cap space, L&T Midcap tops the returns chart with an annualised return of 25.45 per cent. Kotak Emerging Equity is the next best in the category with a return of 24 per cent. The past three months of volatility in equity markets have, however, left investors jittery. S&P BSE Sensex, the broad equity market indicator, slipped around 14 per cent (around 5,500 points) from its all time high of 38,896 in August 2018, to touch a low of 33,349 in October. It is currently hovering around the 35,000 level. The index has lost around 5-6 per cent each in September and October. The correction is even more significant among the mid- and small-cap indices. S&P BSE Midcap has lost around 16 per cent while S&P BSE Smallcap has lost around 25 per cent (this year till mid-November). Most equity mutual funds have given negative returns over a three-month period. The category of large-cap funds is down around 7 per cent while the worst affected are small-cap funds with an average loss of around 10 per cent. The past two-three months have been testing for investors, but they have shown resilience. "It has been a difficult time for many investors who haven't experienced this before," says Satyen Kothari, Founder and CEO, Cube Wealth. Despite the recent market correction, investors have continued with their SIP investments. In fact SIP inflow has touched an all time high of Rs7,985 crore in October, which is more than double of Rs3,122 crore in April 2016. "The industry showed resilience despite the recent market events and the ensuing volatility in both debt and equity segments. Over the last year, there has been 30 per cent growth in retail folios, 14 per cent growth in retail AUM and over 40 per cent growth in monthly SIP contributions. This shows that retail investors continue to repose their faith in mutual funds," says N.S. Venkatesh, Chief Executive Officer, Association of Mutual funds of India (AMFI). The total number of accounts (or 'folios' in mutual fund parlance) as on October 31, 2018 stood at 79 million, while the number of folios under equity, ELSS and balanced schemes, wherein the maximum investment is from retail segment, stood at 66.5 million. This is the 53rd consecutive month witnessing a rise in the number of folios. "Many first-time investors who got attracted after witnessing the returns in 2017 have not been spooked by the recent volatility," says Vijay Kuppa, Co-Founder, Orowealth. This shows that investors have matured over time and understand that volatility is indispensable in equity investing. "We believe that Indian investors have matured in their approach towards investments over the years. This is largely due to the collaborative work towards investor awareness done by the media, distributors, AMCs and AMFI through its campaign - Mutual Funds, Sahi Hai. 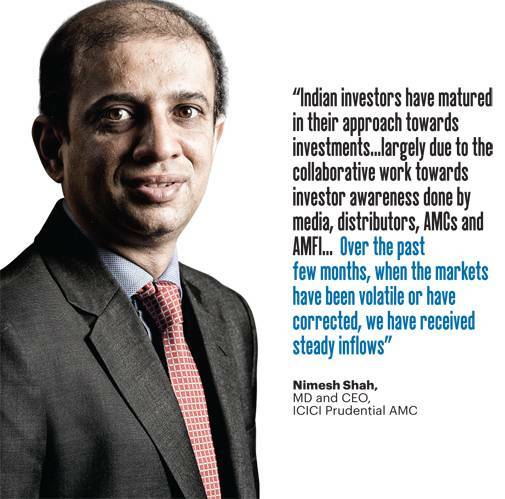 Over the past few months, when the markets have been volatile or have corrected, we have received steady inflows," says Nimesh Shah, Managing Director and CEO, ICICI Prudential AMC. Investors understand that such market corrections are not uncommon in equity markets. Since April 1979 (the time since data is available), the S&P BSE Sensex has delivered negative returns only in 43 per cent of the months. On 18 per cent occasions, the fall is more than 5 per cent. Equities have rewarded those who haven't lost their calm during market volatility and stayed invested for the long term. "Equity as an asset class has the potential to generate high returns; however, it would come with volatility, especially in the short term. Investors have to accept and embrace this fact in order to create wealth through equities over a longer period," says Sundeep Sikka, Executive Director and CEO, Reliance Mutual Fund. A back of the envelope calculation shows that if you had invested in an SIP for 10 years on the 10th of any month, you would have lost money only on three occasions, and on 51 per cent of the occasions, the returns would have been more than 20 per cent. 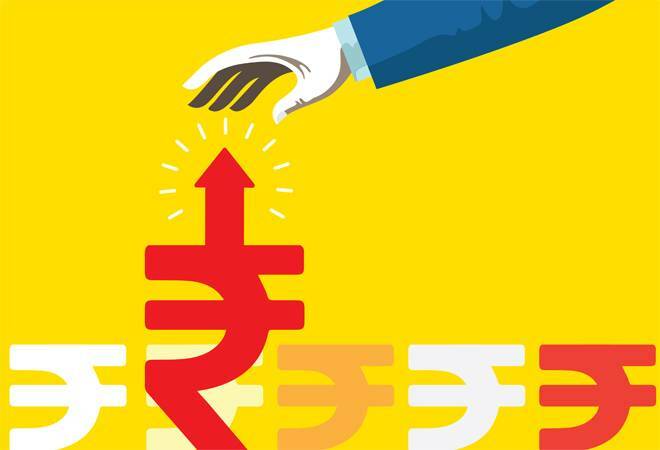 "Investors should continue SIPs during market downturns, as it provides the benefit of rupee cost averaging, and they get rewarded in the long term," says Vinay Paharia, CIO of Union AMC. If you have a lumpsum, the best way to invest is to first invest in a liquid fund and then transfer to an equity fund (or more than one) over time. However, even if you would have put lumpsum money and stayed invested for long term, the chances of you losing money were very less, shows past data. Investors shouldn't get hassled by such market corrections and continue investing. "Markets do not necessarily behave in a linear manner as they are influenced by a host of other factors, both economic and behavioural (greed and fear). We would advise investors to focus on their asset allocation (debt and equity) and consider the volatility of equity markets as a part of wealth creation journey. Accordingly, we advise investors to evaluate equities as an asset class with a longer time frame wherein the volatility is evened out," says Krishna Sanghavi, Head-Equity, Canara Robeco Mutual Fund. Mutual funds have been looked upon as a transparent and a low-cost product and the Securities and Exchange Board of India (Sebi) has time and again brought in regulations to improve transparency and cost effectiveness so that mutual funds become more investor friendly. In 2009, Sebi removed entry loads (these were applied at the time of investment in a fund). In 2013, it directed fund houses to launch direct plans of mutual funds, so that investors who wanted to invest directly in mutual funds, without the help of a distributor, could do so. Direct plans are cheaper as no commission is charged to the investor, while regular plan has distributor commission embedded in it. Last year, the regulator classified mutual funds into different categories in order to bring in more clarity and simplify the decision making process for investors. "Earlier, when the categorisation rules were more fluid, asset managers had the leeway to move across market capitalisations (in equity) and duration and credit (in debt), leading to diverse returns for funds in the same category," says Jiju Vidyadharan, Senior Director - Funds and Fixed Income Research, Crisil. "The new categorisation rules reduce this leeway, bringing in more true-to-label funds within similar categories, especially within equity-oriented funds with alpha that is dependent on stock and sector calls," he adds. As per the new classification rules, mutual fund schemes are classified into five broad categories - equity, debt, hybrid, solution-oriented (retirement/children's funds) and other schemes. "For investors, the benefit is that uniformity and standardisation enables better comparison between schemes across fund houses and helps take informed investment decisions. It will also help them understand the risks, returns and performance of their schemes better," says Vidyadharan. All fund houses have now classified their funds in different categories and merged the similar schemes. So, "it is imperative for investors to review their mutual fund portfolio and check if the reclassified schemes in their portfolio are aligned to their investment goals and risk-return expectations," adds Vidyadharan. Mutual funds have been a low-cost product but over the years, Sebi has removed various expenses to reduce the cost further. Earlier this year, it asked fund houses to disclose the total expense ratio (TER) of all schemes under a separate head on the website on a daily basis. In September, Sebi cut down the expense ratio across schemes to pass on the benefit of economies of scale as the AUM of the industry have grown multifold. Sebi has capped the expense ratio for equity-oriented funds at 2.25 per cent from the earlier 2.50 per cent, and will keep on reducing as the assets under fund grow. It will go down to 1.05 per cent if the asset of the fund grows over Rs50,000 crore. For debt schemes, it has been capped at 2 per cent and will go down to 0.80 per cent in case the asset grows above Rs50,000. Closed-end and interval schemes could charge a maximum of 1.25 per cent for equity oriented schemes and 1 per cent for other schemes. Apart from this, now all the expenses, including commission, will be paid out from the scheme. Earlier, asset management companies were paying a part of the commission to distributors from their own pockets. "Sebi's move to reduce the total expense ratio (TER) of mutual fund schemes is a good augury for investors as it limits their cost incurred. The rationalisation of TER based on fund size, coupled with the earlier directive to disclose TERs on a daily basis, would also bring in transparency and rationalisation of expenses being charged to investors," says Vidyadharan of Crisil. Now AMCs will have to adopt a full trail model and have been barred from paying any upfront commision. Upfronting of trail commission will be allowed only in case of SIP inflows (with conditions) and has been capped at 1 per cent. "The shift to a full trail commission model for distributors would reduce the forced churn and instances of mis-selling of products in the industry," adds Vidyadharan. The 30 basis points of expenses allowed to be charged in case of beyond the top 30 (B30) cities can be charged only on the basis of inflows from retail investors and not from corporates and high net worth individuals. "Lower expenses translate to corresponding higher returns for investors, which is definitely beneficial for investors. The new TER regulations also implicitly encourage long-term investments into mutual funds, as the earnings of all stakeholders are aligned to the longevity of the assets," says Sikka of Reliance Mutual Fund. Mutual funds are not just about investing in equity funds. There are debt funds of various categories that can provide better than fixed deposit returns in a tax efficient manner if invested for long term. After three years, the capital gains are taxed at 20 per cent post-indexation while fixed deposit interest is taxed as per the marginal tax rate of the individual. So, for someone in the 30 per cent tax bracket, debt funds may be a more beneficial option. 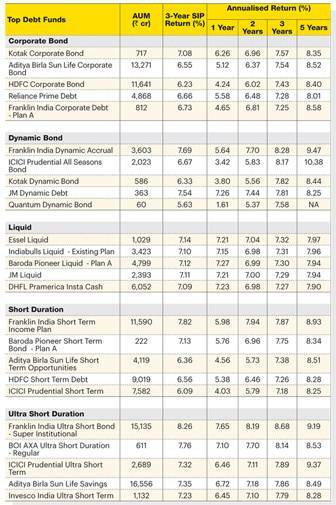 The category of short-term debt funds has delivered around 7 per cent over three-year period. Liquid funds have also delivered around 7 per cent over the same time period. However, 2018 hasn't been a good year for debt funds as they faced a double whammy of rising interest rate (debt funds perform better in falling interest rate scenario) and credit shock in the past few months. As IL&FS defaulted on its credit payment, many of the debt funds wrote-off their holdings in the IL&FS group, which affected the net asset values (NAVs) negatively. However, these are one off instances and should not act as a deterrent to investing in debt mutual funds. At the same time, investors should be aware of the risks that come along with investing in debt funds. "Investors should also note that bond fund returns can be volatile and can even turn negative in a short time period. So, while investing do understand that fixed income mutual funds are different from fixed deposits and do not provide fixed returns," says Pankaj Pathak, Fund Manager - Fixed Income, Quantum Mutual Fund. It is always better to evaluate the credit quality of the mutual fund in which you are planning to invest. "For short-term goals, investors can invest in liquid funds but always prioritise safety and liquidity over returns. Additionally, in the current scenario of risk aversion and uncertainty, we would advise debt investors to stay away from credit risk and invest only in debt funds that invest in good credit quality papers and manage money with prudence by being true to the investment objective of the fund," says Pathak. Volatility is here to stay, be it in equity funds or debt funds. With events such as the upcoming General elections, and the ongoing US-China trade war, markets are expected to remain volatile in the near future. But investors will do better by staying put on their investments and using the market fluctuation as an opportunity. Continue investing in equities through SIPs as this will average out the cost of purchase over time. Do invest in debt too so that your portfolio has some cushion to pass through market turbulence.